Carrying One corresponds well to Maryse Goudreau's fragmented artworks at the border of disciplines and genres. 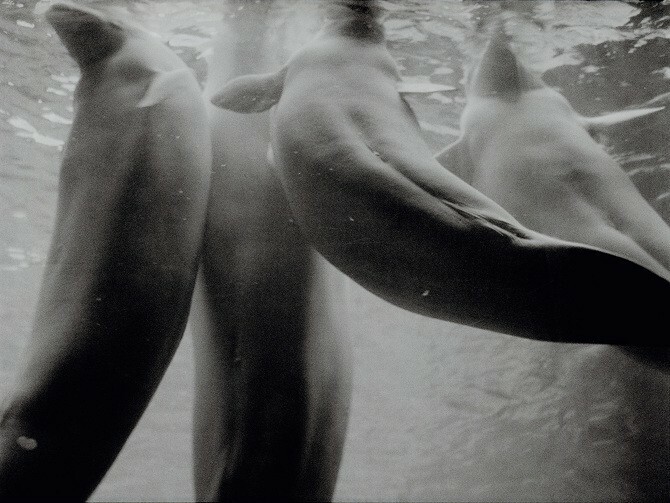 It is the result of a piece extracted from an "archive work" or long-term project that she has been devoting since 2012 to belugas, and more precisely to "the social history of the beluga whale". With its not entirely linear narrative, revolves a quest that is both artistic and social. The idea of gestation concerns both the need to promote the reproduction of the beluga whale that is going into extinction in her native St-Laurence river environment. The beluga whale being threatened; the beluga whale, a coveted object; the beluga whale an emblem of survival; all these images are evoked in a re-enactment of forced migration. In Russia, where belugas also live, they are still captured to meet the demand of the world's aquariums. However, Canadians have yet to solve the problem of difficult captive breeding. In keeping with her time and current environmental issues, Maryse Goudreau stipulates that the future depends on understanding this beluga story. In her mind, and in her quest, the history and future of Quebec are intrinsically linked to the history and future of the beluga whale. Russian and Acadian French with English subtitles. This film is part of Festival Les Percéides Program ACTION LOUISIANE GASPÉSIE! 2019. Maryse Goudreau is an artist, filmmaker and independent researcher. She lives in Escuminac on the Gaspé coast of eastern Canada. Disseminated in different parts of the world (North America, Mexico, Cuba & Europe), her work is also included in national collections such as the Montreal Museum of Fine Arts and the Musée national des beaux-arts du Québec.